Ivy League foe Princeton could pose a serious challenge for its first-round opponent if it makes the NCAA tournament. The Ivy League has unfolded largely as expected this season, with preseason favorite Princeton leading the way, followed by Harvard and Yale—the latter of whom was dealt a severe blow right before the season started when star guard Makai Mason went down for the year with a foot injury. But few likely expected things to play out the way they did, with the Tigers struggling as they started non-conference play 4–6 before reeling off 15 straight wins. Princeton hasn’t lost since Dec. 20, and at 12–0 in Ivy League play, is just one win away from winning the regular-season title outright (it’s already guaranteed at least a share). In past years, the Tigers would be just one win away from an automatic NCAA tournament bid, but the Ivy League will hold its first-ever conference tournament this year to determine which team goes dancing. The Ivy’s top four teams will qualify for the league tournament, making the likely participants Princeton, Harvard, Yale and either Penn or Columbia. The Tigers’ success this season isn’t surprising, considering they didn’t lose anybody of note from last year’s 22–7 squad to graduation or transfer. That team went 12–2 in Ivy League play, but without a conference tournament, fell a win shy of Yale, which went to the Big Dance for the first time in program history. This year, it’s Princeton that’s in the driver’s seat, despite it losing last year’s leading scorer, Henry Caruso, to a season-ending injury in December. Princeton was able to absorb Caruso’s injury thanks to the likes of sophomore guards Devin Cannady and Myles Stephens and senior forwards Steven Cook and Spencer Weisz. All of those players average double figures for the Tigers, with Weisz perhaps the most versatile of the bunch at 10.7 points, 5.5 rebounds, 4.0 assists and 1.6 steals per game. Cannady and Cook are both three-point marksmen, important assets for a team that gets a whopping 43.2% of its points from behind the arc, the fourth-highest percentage in the country, according to Kenpom.com. Where the Tigers don’t get most of their points—just 14.5%—is the free-throw line. Their free-throw rate is the second-lowest in the nation, per kenpom.com, even though they shoot fairly well as a team from the charity stripe. But they’re just not a team built to win inside; Cannady and Weisz take nearly two-thirds of their shots from behind the three-point line, per hoop-math.com, and none of the Tigers’ top scorers take a majority of their shots at the rim. Defensively, the team ranks 45th in the country in efficiency. It’s Princeton’s ability to beat you from the outside that could make it dangerous in a potential first-round NCAA tournament matchup, but first it needs to get there. Harvard, which brought in a top-25 recruiting class this year that included leading scorer Bryce Aiken, has had a strong season itself at 18–7 overall and 12–2 in conference play. The Tigers and Crimson have met once so far this season—a one-point Princeton road win earlier this month—and will meet again on Friday, before potentially squaring off again soon after in the Ivy League tourney. Whether it’s Princeton or Harvard, or even a surprise other team that gets the Ivy League’s NCAA tournament bid, no one should take the conference lightly. The Ivy League has pulled off a first-round upset in three of the last four years, including Yale’s defeat of No. 5 seed Baylor last March. The country is on notice. 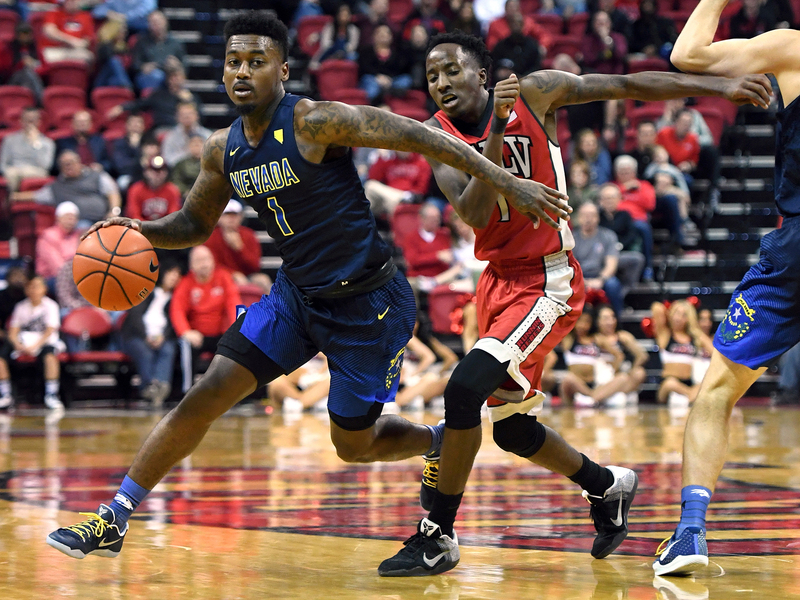 The Mountain West Conference regular-season title may come down to its final day of the regular season when the Wolf Pack and Rams meet on Saturday. Both entered the week at 12–4 in conference play, with Boise State sitting right behind them at 11–5. If Colorado State gets past Wyoming on Tuesday and Nevada defeats San Jose State on Wednesday, it will set up a winner-take-all in the teams’ first and only meeting of the regular season. Of course, the difference between the No. 1 and No. 2 seed for the conference tournament isn’t that influential, but the Rams have never claimed the MWC regular-season crown since joining the league back in 1999. In the final week of college basketball’s regular season, it’s only proper to make this column’s first Player to Watch of the season also its last. Back in December, it was noted that Keene was chasing history this year and could become the first player since LIU’s Charles Jones in 1996–97 to average 30 points per game over the course of a whole season. With just two regular-season games and a conference tournament left, Keene still leads the country at 29.7 ppg. The 30-point mark is within reach, but not without a push in these final games. At 16–13 overall and 6–10 in the Mid American Conference, the Chippewas could have a short stay in the MAC tournament, so any off game for Keene from here on out may doom his chances. At the same time, this is the same player who has scored 40 on six different occasions already this season, including a 50-point effort back in January. In short, it’s never a good idea to count Keene out. Wichita State’s offense exploded last week when it scored 109 points in a 26-point win over Evansville, the third time this season the Shockers eclipsed the century mark. Perhaps the craziest part, though, is that Wichita State’s leading scorer, Shaquille Morris, had only 18 points, and no one else had more than 13. With 16 different players seeing action on the day, which was Senior Night, it was a true team effort.